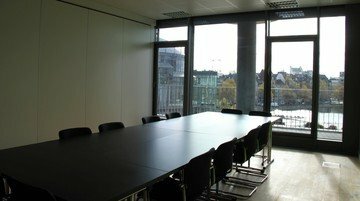 If you want to rent a classroom that is located directly in Cologne, consider this simple but high-quality room as an interesting option. Due to the large window, the room is flooded with natural light and creates a very productive working atmosphere. The very bright room brings creativity from the hidden and creates the ideal environment for undisturbed training sessions, as well as various training sessions for up to twelve people. For this purpose, the location is equipped with a matching table, which offers enough space to work concentrated and to train. Not only large companies want to regularly rent training rooms. Especially start-ups or other small companies often look for the space they need to develop new ideas and strengthen team moral, away from the normal environment. For this reason, the location is not only suitable for large companies, but is also for start-ups, as well as for small businesses with a lower budget, rent the training rooms, an attractive alternative. Especially due to the simple design of the room is a free development the thoughts nothing in the way. Without the table, there is even a total capacity of up to 25 people, so that even larger groups can easily conduct training and rent this training room. If you want to rent this training room, you should know that it is centrally located in Cologne's Neustadt - directly in the Mediapark. Thus, it is located not far from the S-Bahn station Hansaring and provides a carefree connection to public transport. This will also guarantee a reasonable journey for participants who need to go one step further and make the venue easier to reach. In addition to the above-mentioned facility, Wifi is available throughout the room to ensure an Internet connection for each visitor. 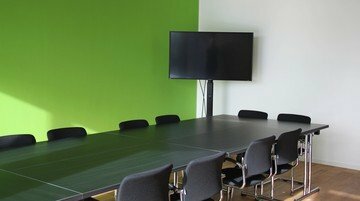 Extras, such as a flipchart, extra chairs or a projector plus screen you have to rent in addition to the training room. Likewise, drinks such as coffee, tea, as well as water and lunch can be booked, of course, the room is available exclusively for the event.